Sugar has gotten a bad rap lately. Did you know that the average American eats 128 pounds of sugar per year? Think of 128 one pound bags of sugar if you like visuals. That is a lot of sugar! Excess sugar intake has been linked to several health conditions from obesity to type 2 diabetes. The general advice is to reduce sugar, but it is difficult when sugar seems to be in everything. We know that sugar is delicious. We believe that sweet treats are perfectly ok to have in your diet. We want you to have your treats and enjoy it- we certainly do! However, it’s a good idea to cut back on the amount of added sugar, especially if you don’t even know it is there and won’t miss it if it’s gone. The recommendation from the 2015 Dietary Guidelines is to keep sugar intake to less than 10% of your daily caloric needs. You can do the math, but this is roughly 25 grams of sugar per day for women and 36 grams per day for men. If you want to do the math, multiply your daily calories by .10 and then divide by 4. Most of us are probably getting more sugar than is ideal. However, it is important to remember that natural sugars an important part of a balanced diet. 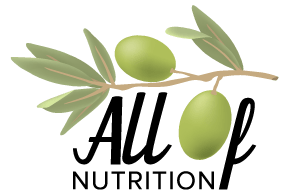 Natural sugars are sugars that occur naturally in foods (think the lactose in milk or the fructose in fruit) and come with fiber, water, and nutrients. 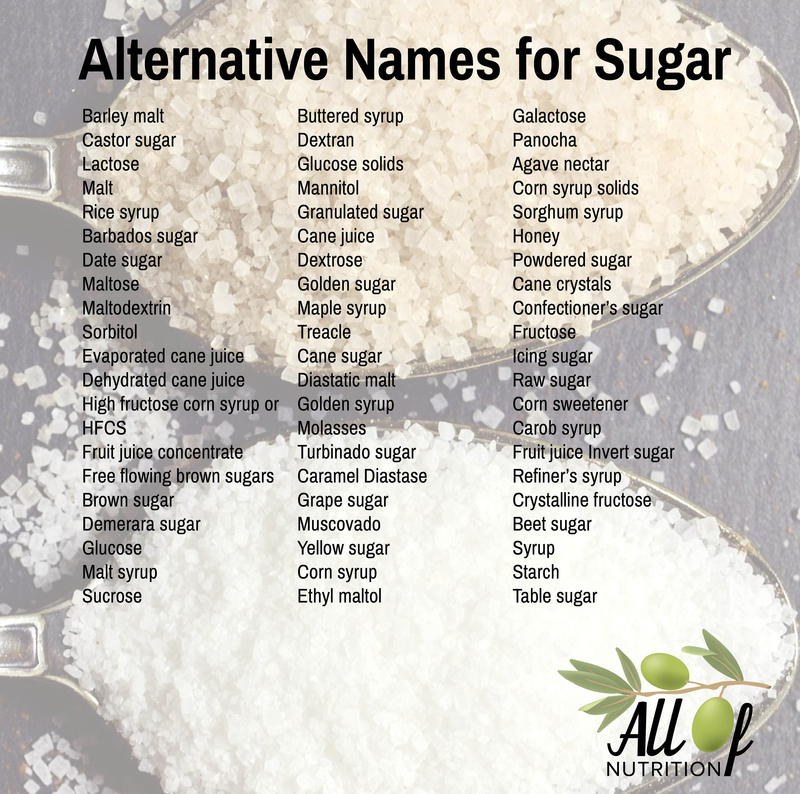 Added sugars don’t generally have any of these. Natural sugars are a great way to add a little sweetness to our lives. We recommend that you continue to enjoy your fruit, just count it as a carb and make sure you balance it with a protein. Beginning to notice and work to reduce added sugars can be intimating. A good place to start is looking at your food labels. The new food labels, by law, have to list added sugars. This means that you can see on your orange juice label how many grams of sugar come from the orange itself and how many extra grams of sugar have been added. Experiment at the grocery store and look at different food labels. Be a detective but try not to get stressed out by the whole process. Start by looking at labels and getting an idea of your current sugar intake. From there, you can make informed choices. For example, if you look at flavored instant oatmeal packets, you will see that it has 12 grams of sugar vs. the 1 gram in old-fashioned oatmeal. One tip would be to microwave the old fashioned oats and add your own sweetener and fruit so you can control the amount of added sugar. Other tips for reducing sugar can include starting your day with a balanced breakfast of a fist of protein and a fist of carbohydrate to help you feel satiated as you start your day. More sleep also equals less sugar. A recent study found that those who increased their nightly sleep reduced their added sugar intakes by as much as 10 grams the very next day compared to their baseline(1). 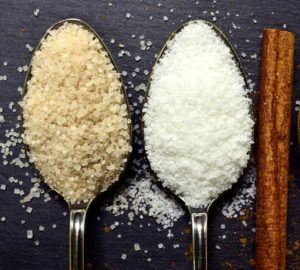 If you choose to, you can modify recipes with sugar replacements. Limit drinking your sugar (soda, juice, etc.). Take a look at how many grams of sugar are in a Coke (it is 39 grams). It is more than double the recommended amount of sugar for most women. Store treats out of sight if they bother you. Eat enough food throughout the day so that you are satiated and less tempted to binge. Give yourself permission to have a treat! Permission is key! If you give yourself permission to have treats and eat them, they lose their magic power over you, and you begin to crave them less and less. (1) Sleeping More May Curb Sugar Cravings, Really.